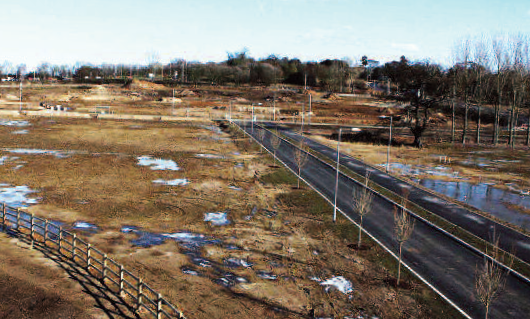 An important 45 acre freehold site adjacent to the main University of Essex (UoE) campus just to the east of Colchester at Wivenhoe. The site fronts the main A133 Colchester to Clacton dual carriageway. The site was owned by a subsidiary of the UoE. A development partnership was established between another UoE subsidiary and a joint venture company owned by First Alliance Properties and Carisbrooke Investments. Resolution of a restrictive covenant imposed on part of the site favouring an adjoining land owner. Devised and evolved the concept of a commercial development “pump primed” by residential. Environment agency approval of innovative engineering proposal to take about eight acres out of the flood plain and make them suitable for development – this land was subsequently granted consent for residential use. Resolution of planning hiatus on access to the site directly off the A133 allowing construction of a new gateway access also serving the UoE campus. Master plan consent obtained for research park/B1, student residences, leisure, hotel, public house, retail, and private residential. Successful execution of £6 million infrastructure contract to install a major new junction on A133 dual carriageway, site road works, services, landscaping and development platforms. Completed December 2011.